Were Directions in the Book of Mormon Confused in Translation? In other words (according to Hamblin) the Semitic minded Nephites tried to say land westward but it got translated “land northward” in the English Book of Mormon. They tried to say land eastward but it got translated “land southward”. They tried to say south sea but it got translated “west sea”, and they tried to say north sea but it got translates “east sea”. If Hamblin’s logic is followed, we should interpret that Nephi was saying that they had traveled “nearly an east – eastnorth direction”. This doesn’t make sense! It does not fit the setting of the narrative! Rather, the directions in Joseph's translation, taken as is, fit perfectly the Hebrew coordinate system! The original Hebrew word translated “the east” in the above passages, literally means “front” – as in facing sunrise. Hebrew scripture is replete with examples. (E.g. Ezekiel 8:16 ; 11:1) These expressions were translated by Joseph Smith without the least distortion! Had there been a problem with representing Hebrew directions with Egyptian styled characters, the Semitic minded Nephites could have simply “reformed” their characters so that they represented exactly what they wanted to convey. Moreover, had there been some difficulty in communicating the meaning of a Nephite expression or symbol into English, the translation could have simply inserted the familiar English equivalent. E.g. the familiar King James Bible term “Red Sea” substituting for the actual Semitic term behind 2 Nephi 19:1 (Isaiah 9:1). The Central American Isthmus of Tehuantepec is far too wide to be the Book of Mormon's "small neck of land" (Alma 22:32) The distance across the Mesoamerican isthmus is comparable to the distance across the Yucatan Peninsula. In fact, the distance across Tehuantepec is about 3/4 as far as the distance across the narrowest breadth of the Yucatan. The "narrow pass" mentioned in the Book of Mormon is described as having water "on the west and on the east" of it. (Alma 50:34) In order to accept a Central American setting featuring the wide, lateral, Isthmus of Tehuantepec as the Book of Mormon's "small neck of land", one has to accept that ancient peoples of that region used outrageously skewed definitions of "west" and "east". The Isthmus of Tehuantepec, lies between the Gulf of Mexico to the north and the Pacific Ocean to the south. It is true that various cultures around the world have different ways of coordinating directions, but ancient Israelites coordinated their east and west according to sunrise and sunset. For instance, the Hebrew expression translated "westward" (in the direction of the Great inland sea) in Joshua 23:4, literally means "going down of the sun". Can we trust that "west" plainly means in the general direction of sunset, and that "east" faces sunrise when the Book of Mormon tells us of a "sea on the west and on the east" relative to a point "by the narrow pass ..."? (Alma 50:34) The answer is yes! The Hebrew word "qĕdĕm" (קֶדֶם) means front or before, it is sometimes translated east or before sunrise. As one stands before the rising sun, "west" is behind or in back. Therefore, the Hebrew word "ahor" (אָחוֹר) meaning back, after or hinder can in some instances be interpreted to mean west. (Yesha'Yahu 9:11 in the Hebrew Bible, Isaiah 9:12 in the KJV) The Dead Sea is sometimes referred to as the "former sea" or "eastern sea" , while the Mediterranean is sometimes called the "back sea", "hinder sea" or "western sea". (Zechariah 14:8) Relative to Jerusalem, the Mediterranean is west, as the sun sets, and the Dead Sea is east - toward sunrise. The LORD said to Joshua, "...unto the great sea toward the going down of the sun, shall be your coast." (Joshua 1:4) It makes sense in the land of Israel to equate seaward with "westward". (Genesis 13:14) The Hebrew dictionary in the LDS RESOURCE EDITION of THE SCRIPTURES notes that seaward, pronounced "yamah" (יָמָה) is locally "westward" (in the direction of the Mediterranean). In other words, seaward is "westward" in the land of Israel. Interpreting seaward as west elsewhere risks taking things out of context. Similarly desert-ward, "negbah" (נֶגְבָּה) is used as another way of saying "south" in the land of Israel, because there is desert to the south. (Joshua 18:14) This does not mean that ancient Israelites, outside of the land of Canaan, were inclined to arbitrarily designate "south" in the direction of an arid land, or "west" in the arbitrary direction of a seashore. The Israelite compass is actually based on the perceived movement of the heavenly quarters, and there are other terms in Hebrew scripture for east and west, and these terms directly relate to sunrise and sunset. The Hebrew word "mizrah literally means from sunrise or place of sunrise and is translated mizrah" is translated "east" in Joshua 11:3 (KJV). In the same verse, "on the west" literally means "from the sea" (the Mediterranean). The English word east relates to the Greek eos meaning dawn. The Hebrew word for west, "maarav" means from evening or place of sunset. (Isaiah 45:6; 59:19) This Hebrew word for west appropriately applies to places beyond the confines of the land of Israel , and would certainly have been used by Lehi and Nephi. (Psalm 103:12; 107:3, Isaiah 43:5) The English word west relates to the Latin vesper, and has much the same meaning as the Hebrew word. There is no sound reason to suppose that the LORD would allow the meaning of "west" in the English translation of the Book of Mormon, to not remain true to its origin. 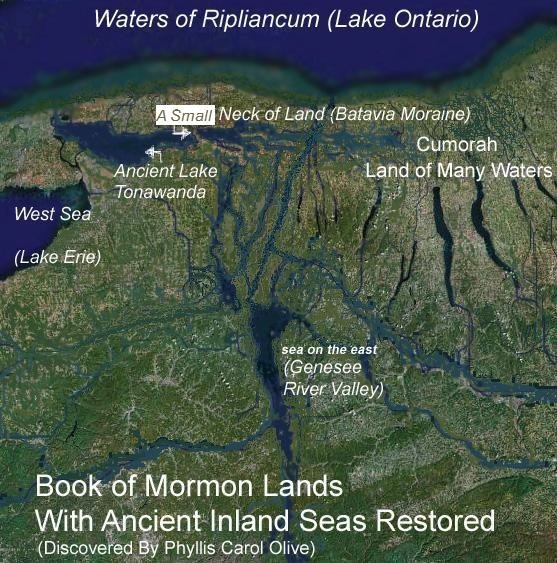 Phyllis Carol Olive, author of The Lost Lands of the Book of Mormon, has found what the lands of western New York would have looked like with ancient inland seas restored. The lands that appear, match descriptions given in the Book of Mormon in terms of location, orientation and elevation. Western New York was once occupied by peoples classified broadly as "mound builders". Phyllis Olive's discovery of a small neck of land (a moraine passing through ancient Lake Tonawanda) squares with scripture and the Israelite compass. Sister Olive has realized that the lands of the Book of Mormon cannot be thousands of miles distant from the place that scripture designates as Cumorah. (Doctrine and Covenants 128:20) Sticking with the Scriptures, Phyllis has discovered, or rather rediscovered, the genuine lands of the Book of Mormon. Click on Broad Neck to find an article titled The Tehuantepec Smoke Screen - Obscuring the Truth about Israelite Directions in Order to Sell Mexican / Mesoamerican Cumorah Theory. This article discusses in greater detail how the Central American theory fails to follow LDS scripture and actually misplaces Book of Mormon lands. Click on American Land of Israel for Olive's Near Cumorah Setting by Deduction and Best Fit!